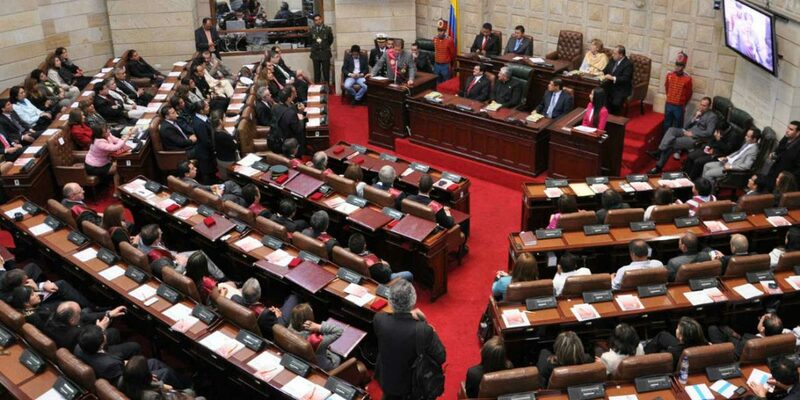 Colombia’s senate reduced the capacities of a war crimes tribunal that seeks justice for millions of victims of the country’s armed conflict with the FARC. The limitations imposed on the transitional justice system could leave the door open for the International Criminal Court to intervene and begin prosecuting alleged war criminals, the original proponent of the regulations bill, Senator Roy Barreras, warned his colleagues. Particularly controversial was the 18-month delay on the investigation of members of the security forces to create a separate chamber for members of the military. The ban was requested by the Democratic Center (CD) party of President-elect Ivan Duque. Most state war crimes were committed when former President Alvaro Uribe, the political patron of the incoming head of state, led the country between 2002 and 2010. In its original form, the court would try some 7,000 FARC guerrillas, 24,000 armed and non-armed state officials and 12,000 civilian suspects of war crimes. The Constitutional Court shielded civilians and non-armed state actors from compulsory cooperation with the transitional justice system leaving the guerrillas and some 2,100 members of the armed forces. Victims can continue to accuse suspects in the future. Whether the high court will allow Congress’ further limitations is uncertain. The Special Jurisdiction for Peace (JEP) is the result of a peace process between the Colombian state and FARC guerrillas who laid down their weapons last year after more than half a century of armed conflict. The fighting that involved multiple actors, left more than 8.5 million victims, many of whom lost their land after being displaced from their homes. Many on both the left and the right feel resentment about the crimes that were committed. Some who gained land through the displacement of others resist land restitution. The court has been stripped of so many of its original powers that it hardly resembles the war crimes tribunal agreed between the FARC and the government of President Juan Manuel Santos. While the International Criminal Court has urged the speedy investigation of the illegal execution of thousands of civilians under former President Alvaro Uribe, his hard-right party successfully impeded exactly that. FARC leader Rodrigo Londoño, a.k.a. “Timochenko,” asked the Constitutional Court to correct the bill that passed congress and remove an article that disallows the court to demand to see evidence in the event a suspect is requested for extradition. The FARC and victim organizations are afraid that Duque will extradite FARC leaders on US drug trafficking claims, effectively making the investigations into war crimes impossible. When Uribe was president he extradited the leadership of paramilitary organization AUC, effectively ending many of the investigations into paramilitary crimes, including alleged war crimes that implicate the former president and his family. Colombia, what have you done? The political violence in Colombia got so bad that one in five Colombians is a direct victim of the conflict, meaning they for example were displaced, were kidnapped or lost a family member. Almost all of the war crimes committed during the conflict were never taken to court, meaning that neither FARC leaders nor state officials have faced the victims or the judicial consequences of uncountable crimes against humanity. A restorative justice system was agreed in the peace deal, but under major political and social tensions. Peace is fragile and violence, especially targeting social leaders, has increased. The International Criminal Court, which is located in The Hague, Holland, can assume investigations if it finds that the Colombian justice system is unwilling or unable to effectively prosecute crimes against humanity.